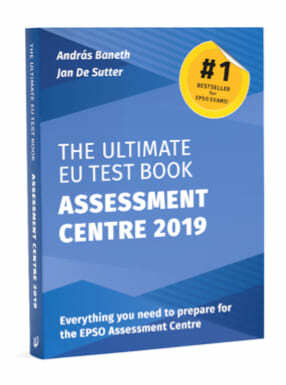 416 pages packed with systematic advice and methodologies for tackling EPSO competitions, with hundreds of AD-level verbal, numerical, abstract reasoning and situational judgement test questions with answer explanations. Packed with strategies, tips, advice, practice exercises: all you need for Assistant (AST) and Secretaries (AST-SC) exams. A comprehensive, brand new edition including e-tray exercise, competency-based interview, case study, structured interview and much more. Shows how to evaluate and improve your personal performance in the EU “core competencies − for greater job satisfaction, positive performance reviews and career success. Learn everything you need to know about EPSO exams. Practice realistic tests and find detailed explanations. Beat the competition thanks to detailed methodology chapters. Wish to try real-time EU exam simulation?